During the last week, I went with my brother Brian and his girlfriend Amanda to visit San Diego. There, we met with our cousin Chris, who is a Marine stationed at Camp Pendleton and lives in nearby Carlsbad. 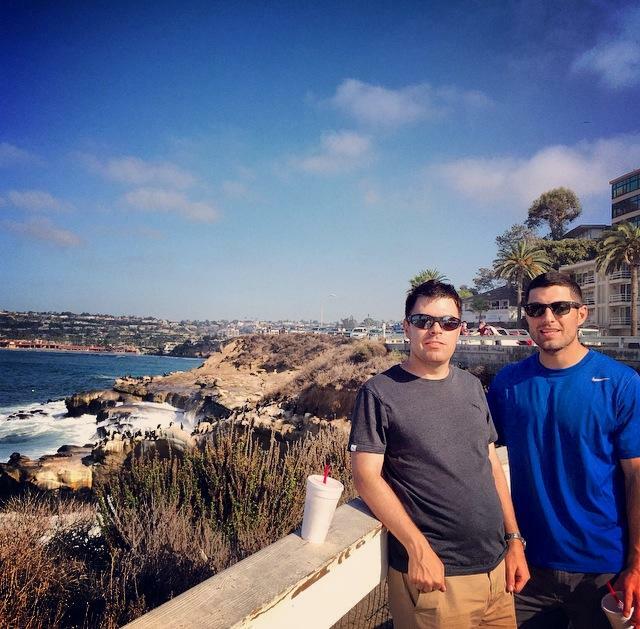 We got to see various attractions in the city, such as The San Diego Zoo, Potato Chip Rock in the mountains of Poway, the beaches of Coronado, Pacific Beach, and La Jolla, and other sites. We also met with our cousin Chuck and his girlfriend Alice during the weekend in La Jolla, which is where we stayed during the course of the trip. Brian, Amanda, and I arrived in San Diego on the morning of Friday, October 17. It was a beautiful day when we arrived at the airport, awaiting to be picked up by Chris at the front entrance. He then took us his apartment in Carlsbad, where he has two roommates Joe Deignan and Nick Oney, along with a pit bull mix named Tally and two cats named Atlas and Pippa. After being introduced to Chris’ place, we then checked a local burrito place called Senor Grubby’s, where I had a delicious burrito, which had chicken, vegetables, and french fries in the meal. We then went back to check in to our hotel in La Jolla, which is a rented house, with a nice deck with chairs and a hammock, a hot tub in the backyard, a pull-up couch, which converts to a bed, and a basement with a pool table and a flatscreen TV attached to the wall. We were then introduced to Camp Pendleton, which each of us performed a flight simulator test to demonstrate what it would to fly and pilot a helicopter. At the end of the day, we went out to Pizza Port in Carlsbad, where I made new friends such as Molly Boyne, Jaci Conrad, and Joe and Nick. It was a nice kickoff to the beginning of an exciting trip. The next day was easily one of the highlights of the trip. 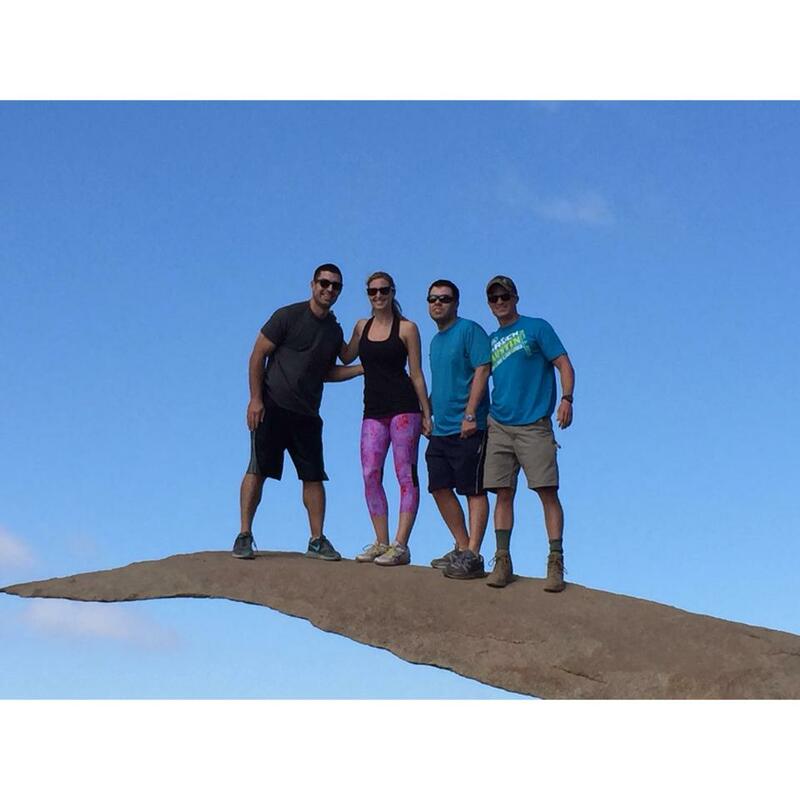 Brian, Chris, Amanda, and I went for a hike to Potato Chip Rock in the mountains of Poway. The hike took us about 90 minutes to reach the rock at the top of the mountain. In order to take make to the cliff of Potato Chip Rock, you have to jump across a crevice to reach the peak. I bravely jumped the cliff with the aide of Brian, Chris, and Amanda and we ended getting a beautiful photo of us at the rock with some spectators in the background. Later on, we met up with Chuck and Alice for dinner at George’s at the Cove, a restaurant in La Jolla. We talked about life in San Diego and how are current careers have been going during the course of the meals at the restaurant. We ended the night with some dancing at the nearby Prospect Bar with some drinks to fit the atmosphere of the weekend. On Sunday, Brian, Chris, Amanda, Molly, and I went to a shooting range near Camp Pendleton to practice using guns. I was a little bit nervous at first before doing the mock shootings since I had never used a gun before in my life, but get used to handling the weapons after some tutorials. I then fired a handgun and rifle at targets to conduct my skills at controlling the guns. Brian and Chris practiced shooting shotguns, but Amanda, Molly and I sat out during the shotgun demonstration. These practice shootings gave us new experiences on what it is like to use guns at a shooting range. At the end of the day, we went to the Zac Brown concert in Chula Vista, south of San Diego. Zac Brown played a mix of his original songs and covers of songs from the past four decades. It was my first time going to a concert in a state outside of my homeland. Monday was another exciting day during the trip. That morning, Chris took Brian, Amanda, and I to Montgomery Field Airport, just north of downtown San Diego to learn how Chris pilots airplanes. We went on a small Cesna airplane piloted by Chris and his co-pilot for the day, Terry and flew over the downtown of the city with views of Chargers Stadium and the downtown below. It was an exhilarating adventure getting to fly on a plane piloted by my cousin and seeing the views of the city from the skies. We closed the night by staying at a rented hotel on Camp Pendleton, where cooked steak and chicken dinners on an outdoor oven near the beach and had S’mores on the backyard of the hotel. The next day, we went back to our hotel in La Jolla, as Chris had to work during the day. Brian, Amanda, and I checked nearby Windanesa Beach when the weather was so nice outside. We managed to get some rays and tans and walked along the sandy shores and water of the beach. The waves were bigger than any beach I had seen closer to my summer house of Marshfield. After checking out the beach, we took strolls alongside the streets of La Jolla and saw great views of various additional beaches in the community. We also got to indulge in delicious Mexican cuisine at Alfonso’s for Taco Tuesday and I had some nachos as appetizers and a Tijuana Taco with a Dos Esquis beer for my main course. We finished the day with great meals at Whisknladle in downtown La Jolla, where I had a great burger, which had cheese, a fried egg, and caramelized onions inside the burger. Wednesday was also easily one of the highlights during the week long San Diego trip. Brian, Amanda, and I visited the San Diego Zoo for the first time. I was pleasantly surprised at huge the Zoo is in terms of area. At the Zoo, I got to witness various interesting animals, such as a polar bear, a rhinoceros, a hippopotamus, Tasmanian Devils, leopards and cheetahs, monkeys and orangutans, and many other members of the animal kingdom. We also went on a glider, similar to that of Epcot Center, which provided us views of the many zones at the Zoo and the skyline of San Diego. It was truly delightful to get to see many different kinds of animals in the different zones at the Zoo since back home in Massachusetts, many of the animals would not be able to adapt to the colder habitats of New England in the winter. After leaving the Zoo, we then headed south to Coronado to check out the world famous hotel and beaches. I found out from the tour guide at the entrance that the famous Marilyn Monroe movie “Some It Like Hot” was filmed at the hotel in the 50s. Brian, Amanda, and ate at the local restaurant in the hotel and took a walk alongside the sandy beaches and saw some gorgeous hotels and condos near the beach. Later on, we met up again with Chris to celebrate his 29th birthday at Blue Ocean Robata and Sushi Bar in Carlsbad. The sushi was great and we talked about what we saw at the Zoo to Chris and wished Chris the happiest of birthdays. We then went to Chris’s place to watch a few classic episodes of “The Simpsons,” one of Chris’s favorite television series of all time. Thursday marked a momentous farewell to the delightful week that we had in San Diego. We started the day by going to Pacific Beach, which is just south of La Jolla. Pacific Beach is a community that attracts a younger crowd, with some transplants from the Boston suburbs. The beaches were majestic and we walked along the nearby the pier to take photos with views of the nearby buildings and check out the views of the waves. We had lunch at Jordan’s Restaurant near the beach and even took a visit to the deck with a pool upstairs after finishing our meals. The trip to San Diego concluded with Chris, for one last time, taking us for supper at Island Prime/C Level, where we thanked Chris for being in our lives throughout much of the trip. We then bid an emotional farewell to him after being off at San Diego Airport awaiting our flight back home to Boston.